Over the last several days, I have been udating a number of nodes to 3.19.3.0, mostly AirRouters running tunnels. 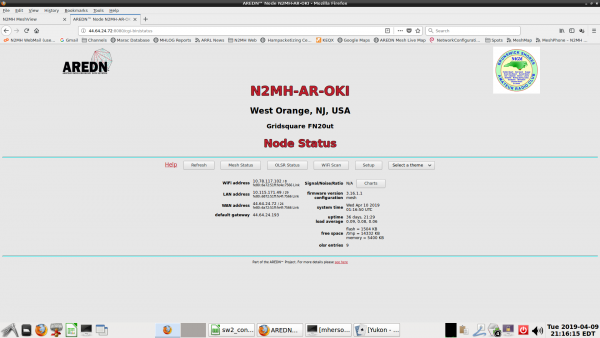 A few months ago, I reconfigured these nodes with new, static, WAN addresses. I have been doing this updating using the WAN address to avoid losing contact with the node due to OLSR restarting. Many times, after the new firmware has been loaded and automatically rebooted, the node never comes back to my web browser. After seeing this several times, on a hunch, I changed the url on the web page to point to the old ip address in the node before it was changed. I was amazed when this did the trick and the node with the new firmware appeared. 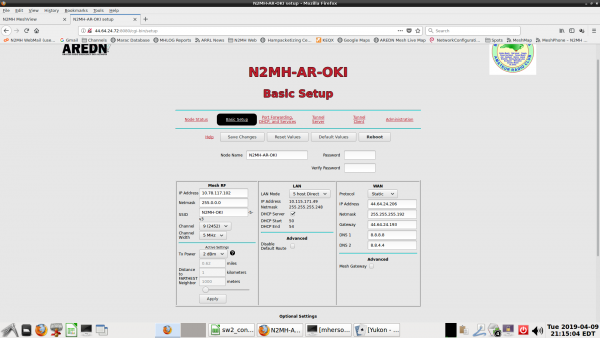 Going to the Main Setup screen showed that the old WAN address was there, not the new one that it was changed to. Changing the address to the new one, saving it and rebooting restored connectivity on the new address. Before I did one more node today, I was able to take some screenshots that provided some information. I have a screenshot that shows the main web page of the node when I first connected. The url and the wan address shown on the node page are the same. I then went to the tunnel client page and turned off all the tunnel(s) prior to flashing the node. Then I went to the main setup page to look around. There, I found the WAN address was showing the old address from months ago, but the url in the browser was clearly on the new address and working. I then reconfigured the old address to the new one, saved it, and the update process went smoothly. So, because of this, I'm wondering if there may be a latent bug with the code that turns off tunnels in the old code. Old code since it happens before flashing with the new code. This old code that I was using is 3.16.1.1 and a handful of nightly builds since then. I recall that they included 3xx, 5xx, and some 7xx nightlies. I am not sure if anything else was affected, so that's why I call this a "partial". To see the screenshots, change the file from .tgz to .zip and unzip them. When coming from older (Pre-3.18) releases, the WAN port must be set back to DHCP for on-air upgrades. (It's noted in the upgrade instructions). There was once an issue with upgrades on nodes with STATIC WAN settings that didn't translate properly and would result in a munged config file, possible brick or strange behavior. This has since been fixed with 3.18 and later firmware. I'm now able to upgrade my STATIC WAN nodes OTA without changing the WAN port back to DHCP. An additional note is that I REMOVE the VTUN module or MESHCHAT if present, leaving the settings intact - reboot, then upgrade. After successful upgrade, I am able to re-install the VTUN module and all of the connections resume as before the upgrade.